Well, summer is slowly fading away and here in Georgia I am starting to catch some small glimpses of fall. A few more leaves are starting to drop from the trees, mornings are a tad cooler and the cicadas are dying. I can always tell fall is coming when I start seeing dead cicadas in the driveway! Last weekend I started getting the garden beds cleaned out and made a trip to the nursery to see what sort of fall plants are available. Depending on what area of the country (or the world, for that matter!) that you live in you may be able to get a few more months out of your garden. You just need to know what to plant and a few other fall gardening tips. 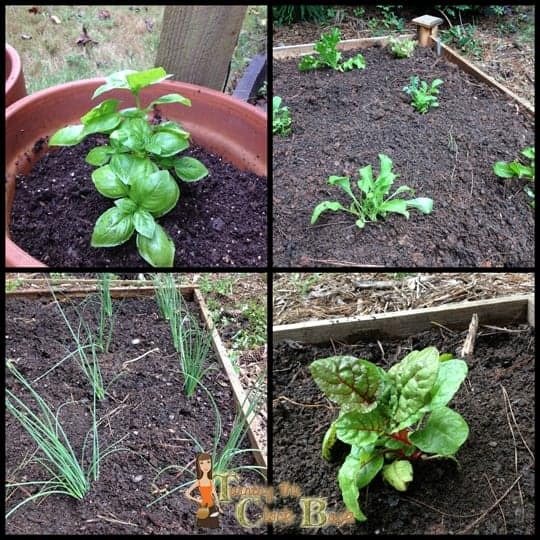 There is nothing better than heading out into your yard and picking some fresh lettuce or a few herbs to throw into your evening dinner. The first of my fall gardening tips is to know what you should pull out and what you should leave in for a while longer. My tomatoes are almost completely done at this point and I am just waiting to see if the last few will actually ripen in the next couple of weeks. The peppers are still going strong so I will leave those for now. We get a ton of hot peppers and dehydrate them all summer to add to chili or other spicy dishes. In fact, my husband and son think EVERYTHING should be spicy so we go through a lot of dried peppers. The beets never did much, unfortunately…I have yet to figure out how to grow them and am about to give up. If you have any tips for growing beets please feel free to leave a comment and let me know! 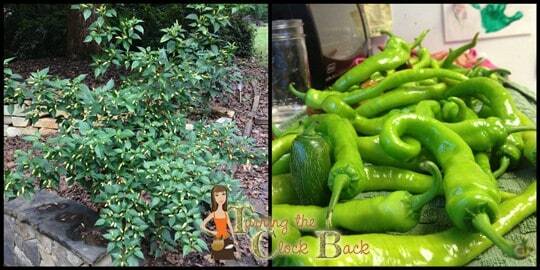 The pepper plant on the left is a Tabasco plant and boy are those little buggers HOT! The ones I picked on the right are primarily a cayenne hybrid that is mildly spicy but adds a bit of ‘bulk’ to our pepper mix. I usually try to avoid the hybrids but for some reason this was the only cayenne pepper I could find at all last April. I spent an hour pulling out assorted potatoes and sweet potatoes. I probably should have left them a few more weeks but honestly I was dying of curiosity to see what sort of treasures I had waiting underground! 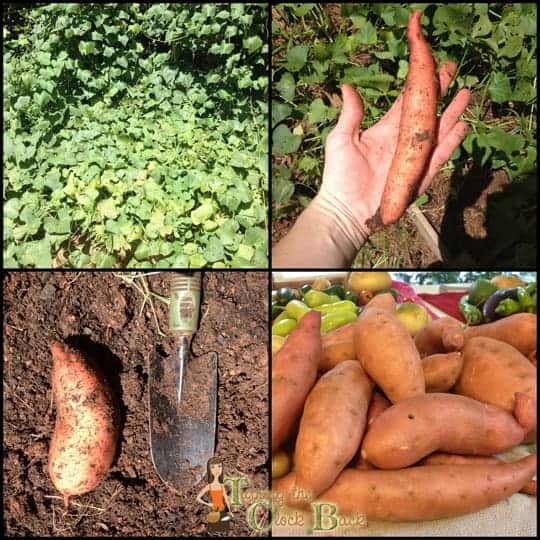 That is the problem with root vegetables…no way to know what you have til you yank it out of the ground and then you can’t grow it any bigger! Well, I had so so luck with the regular potatoes but the sweet potatoes were growing like gangbusters. In fact, the vines were taking over my yard! Along with all the neighboring trees and shrubs! This is the first year I attempted sweet potatoes and I must admit I am very proud of my harvest. Seeing as I live in Georgia I think this is definitely proof that choosing things designed for your climate helps improve success rates! After you have everything pulled out of the ground that needs to go you need to plan what else you are going to grow. Look at Better Homes and Garden for a great garden directory of what to plant in your zone. Primarily you are look for things that don’t have to ripen or create ‘fruit’. Lettuces, certain herbs, Swiss Chard and other greens, broccoli, cauliflower, green onions, snow peas, and several other plants will thrive in the cool weather of September and October. Things like radishes that have a short time from seed to harvest are also a good choice. Before you put your plants in the ground make sure that your garden frames are still in good shape. You may want to add a bit of compost or organic fertilizer to the soil before you start planting. If you have had plants in this soil all summer it is possible that it is a bit short on nutrients. You also want to take a look around at the surrounding landscaping and try to decide which areas are going to be getting the most sunlight. The angle of the sun changes as we move from summer into fall so make sure you are planting the taller plants in back or your tiny lettuces and radishes will be stuck in the shade. Remember to look up your earliest frost date and keep that in the back of your mind at all times or you risk losing some of your garden harvest to frost! Keep some old sheets handy to use as row covers on nights you are expecting frost. You can also use clean milk jugs that you cut the tops off of if your plants are rather compact. And remember to water in the morning a couple times a week. Just because the weather is cooler doesn’t mean that the plants don’t need water regularly! Good luck and happy planting! Do you have any fall gardening tips you would like to share? Wow, your garden is very impressive. Those sweet potatoes look marvelous. Thanks! I got a ton of small ones too, those are some of the biggest. The small ones I roasted up with some chopped onion and olive oil. Very tasty! Your garden looks wonderful! I miss having a garden this year - and haven't tried on in the Fall, but you have given me some inspiration! thanks! Of course, I didnt show the pic of the cantaloupe plant that gave me one melon that rotted before it got ripe or the beets that were only the size of golf balls :) I keep trying though! I wish I had gardening tips to share! I wish I had a garden. I wish I had time to figure it all out. So jealous! it gets easier every year in terms of prepping soil and such, especially with a raised bed. You could try container gardening. very easy and almost no work other than to water it occasionally! So jealous of the sweet potatoes! Maybe next year I will try growing those. Here in Texas, all my herbs have withered but I am attempting to salvage them by transplanting them into pots that I put in the shade of my porch. We are in a drought and only allowed to water once a week, so I am using my excess shower water to keep my bell peppers alive. So far, those are the only things left! I would love to get some more swiss chard and kale going for the fall. We have had so much rain that alot of my stuff rotted! This is a first for Georgia and I am amazed I got the harvest I did from the sweet potatoes. Made some into sweet potato pancakes tonight and they were delicious! I seriously have a black thumb! This year I have tried again with simple herbs. They are doing pretty well. Your garden looks fabulous! I'm so envious. Herbs are a great start! Next year, stick in a pot of tomatoes and you are on your way! My parents grew beets out in Wyoming where it is not as hot as Georgia so you might try them in the fall or early spring, the greens from the beet are great to eat. I got them in the ground in march this year but it gets hot too quickly. I probably should get stuff in the ground in February but I am just not thinking about gardening yet in February! Fall seems like the perfect time to plant those greens with little effort for maintaining. Good post.